Should I Get a Fixed or Adjustable Rate Mortgage? | Neat Capital Inc.
Are you afraid of over-paying for your mortgage? Turns out there are more options than just your typical, run-of-the-mill 30yr fixed mortgage. It’s important to understand loan program and interest rate options to strategically structure your home loan to work in your favor. Determine with clarity and confidence which mortgage program is best suited for your needs. A fixed rate mortgage has a fixed interest rate that does not change over time. This means that if you’re approved for a home loan at 4.5%, your loan will remain at this rate for the entire duration, unless you choose to refinance. Despite changes in the market, there will be no variance in your rate. This is a long-term plan that typically benefits individuals who intend to own for more than ten years or for those who are purchasing when rates are historically low. Fixed rate mortgages typically have higher payments than adjustable rate mortgages, however, you might still choose a fixed rate simply because you want to remove all future interest rate risk. Although fixed rate mortgages are the most common program selected and offer total assurance in homeownership, such programs do not always benefit every borrower from a strategic standpoint. Therefore, it’s important to fully understand your options. Which rate you should choose is dependent on your circumstances. Myth: An adjustable rate mortgage changes every month. Fact: An adjustable rate mortgage (ARM) is a loan that is fixed for an initial period of up to ten years before it enters its adjustment period, where the interest rate adjusts once per year. An adjustable rate mortgage (ARM) is a loan that is fixed for an initial period before it begins to adjust. Once an adjustment period begins, your rate is calculated using an index (a market indicator, i.e. LIBOR) and a margin (ex. 2.25%). The exact index and the margin are characteristics of the loan, and are specified up front upon selection of your loan program. ARM loans are typically quoted as "5/1", "7/1" or "10/1". The number before the slash is the length of the initial fixed period in years. The number after the slash is the number of times the rate adjusts per year after the initial fixed period has ended. To avoid wild variations in your payments, there are also caps to ensure your interest rate does not adjust too dramatically. These caps are typically quoted with three numbers, ex. "2/2/5". The first number (2) is the maximum change in interest rate upon the first adjustment. The second number (also 2), is the maximum change in interest rate after the first adjustment. The third number (5), is the maximum increase in interest rate above the starting interest rate. In the event the index ever went negative, the minimum interest rate is typically the margin. By understanding how and when ARMs adjust, there is in fact some certainty with adjustable rate mortgages too. Adjustable rate mortgages are strategically used by home buyers with short term timing, strong assets to pay back the loan, or for cash flow management. ARMs are riskier loans because there is an adjustment period at some point in the future and therefore the payment could go up. Additionally, it is a common misconception that rates can only go up, when in fact they can adjust up or down based on market conditions. Generally, however, the less time your loan is in an adjustment period, the better. However, if you accurately calculate the price of your loan with a fixed mortgage and compare it to the worst-case scenario of an adjustable rate mortgage, you may have an opportunity to save on your mortgage. Although it is imperative to take your special circumstances into account and consult with a home loan advocate, there are many instances where ARMs may benefit you financially in both the short and long term. Let’s say you were approved for a 30yr fixed mortgage at 4.750% and a 10/1 adjustable rate mortgage at 4.125% with a 2/2/5 cap. 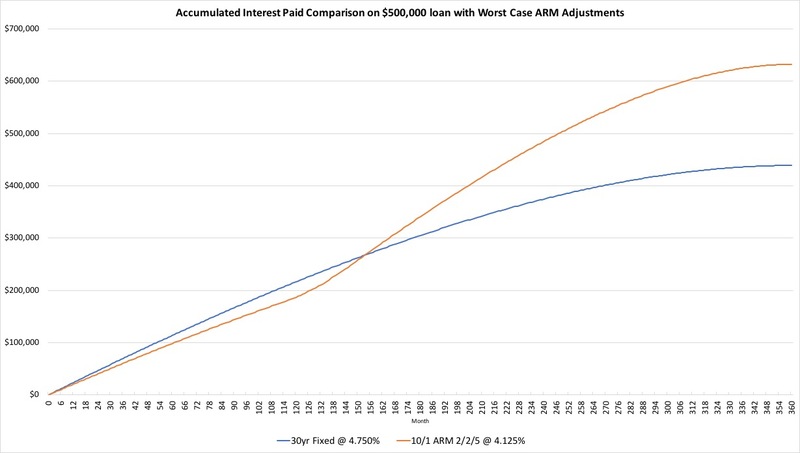 If your loan amount was $500,000, the first ten years of your fixed-rate mortgage would cost you $216,500 in interest and the 10/1 ARM would cost you $186,300. If you moved or paid off your loan at the end of ten years, you would recognize $30,235 in savings. If you stayed another year and the rate went up to a worst case 6.125%, you would lose some of these savings but still be ahead by $25,199. If the next year another 2% rate increase happened, at the end of the 12th year you'd still be better off by $12,532. If at the 13th year, the rate adjusted upwards again to the maximum possible rate of 9.125%, you would still be ahead in savings until you made the 154th payment. After that point the fixed rate loan would offer more savings. Even with these worst-case adjustments, depending on how long you stay in the home, it's possible that the savings generated during the initial fixed period can outweigh the possible increased costs later associated with interest rate increases. If you do not plan to stay in the house longer than ten years, expect to have excess funds to pay the mortgage down or even off during this period, you may experience greater savings with an adjustable rate mortgage. Additionally, if you change your mind in ten years and instead decide to re-evaluate your loan, the fees to refinance are likely less costly than the money you would have spent on a fixed rate from the beginning. The difference between a fixed and adjustable rate mortgage is the rate variability or lack thereof. Rates on ARMs will go up or down, while fixed rate mortgages will remain constant throughout the entire life of the loan. Through calculation and analysis, it is clear that both loan types offer varying degrees of advantages and certainty. Next time you apply for a loan, be sure to calculate and analyze both options to ensure you’re getting the best loan structure for your needs. The more you know about each, the easier it will be to formulate the loan program and terms that work in your favor.